To enter, you need to make a 3 minute video of yourself presenting on a technical topic, so don't dawdle! If you are sure you don't want to enter, either because you're already a Tech Ed speaker or because you'd rather die than speak in public, be sure to at least plan to watch. I found it highly entertaining. 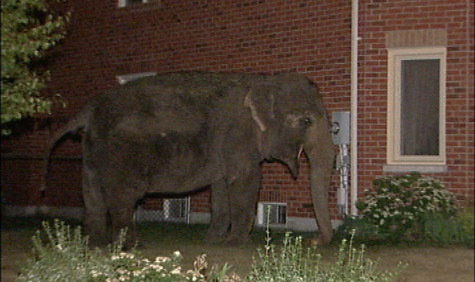 What do you do if you see an elephant crossing the street at 3am? My favourite part is the elephant who didn't particularly notice they'd escaped and went to sleep just outside the pen. 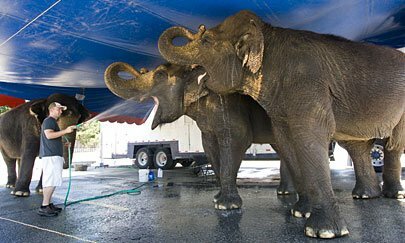 She's the one at the far left not being sprayed with the hose. Update: The National Post provides this delightful picture, and links to the 911 call and dispatcher conversation. "Outstanding elephant" indeed. And what a nice police department to host the mp3s - not all would. In a talk on IDE tips and tricks for Visual Studio, I asserted that good programmers are ten times as productive as ordinary ones. I didn't remember where I'd read that, but I knew it was true. I've just worked with so many folks who need a week to do what some superstars can do in a morning. The ordinary guy needs half a day to find some samples that are similar, half a day to tweak them so they fit into the current situation, a day to test and realize they aren't quite right, a day to adjust them and then fix the things that broke while adjusting them, half a day to get distracted and lured into scope creep by some comments during user testing, then another day to fix up what they did that they shouldn't have, and finally a half a day to clean things up and make documentation. The terrific guy only spends an hour finding samples, stays focused, documents and tests along the way, and makes short work of a specific small task. And I find this holds over months and years as well as over the course of a week. Now I bumped across a proper cite of that, and not surprisingly it's from the Mythical Man Month. The quote and some related musings is over on Phil Haack's blog. Worth reading and worth thinking about. There are many ways to be productive ... write code that solves the real problem, don't write buggy code, don't write brittle code, and so on. Just a small personal observation. My oldest child turned 18 and is now technically a grownup ... though of course still living at home and still technically in high school ... graduation is only six days away though. So many of my fellow RDs and MVPs are new parents, it seems strange to be approaching "the end of the beginning" of my parenting journey. But that's how it is. What should your exception class derive from? There is a lot of confusion about writing your own exception classes. I see far too much code out there that just catches "Exception" anyway, that I hate to complain about someone who has set themselves up to have different catch behaviour for "The server is probably offline" than for "you probably don't have permissions on that file you just told me to use". However those who write their own exceptions have generally derived them from ApplicationException. If you ask why, they say things like "well" and "er" and "um" a lot because there's no extra stuff in an ApplicationException compared to an Exception. It just made it possible for you to catch "ApplicationException" and know it would be one of yours and not from some framework code. Only thing is, that didn't really work out -- some framework code throws exceptions that derive from ApplicationException. And really, catching ApplicationException is just as generic as catching Exception. What can you meaningfully decide to do when all you know is "some code I wrote is unhappy in a way that the built-in exceptions (invalid argument, access denied and so on) cannot properly express" ? So the word is out. Don't inherit from ApplicationException. Got it. The one I'm most likely to use is Copy as Path. Lets say you've just put a file on some shared drive somewhere and now you're emailing someone that you've done so, or you're passing the full file name to another application, or you're recording the file name in the files itself so that printed copies make sense. 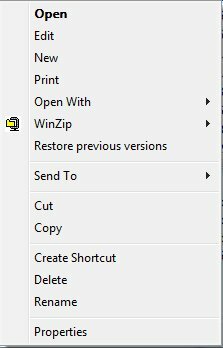 You need to copy the path from the address box, then the file name - it's annoying. This little trick doesn't save a ton of keystrokes, but I like it.